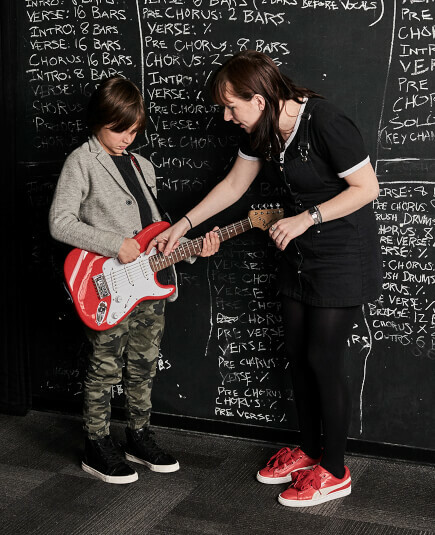 School of Rock East Brunswick’s music teachers are experienced musicians devoted to helping students attain musical proficiency. From singing to drums to guitar, our East Brunswick music instructors inspire and teach students to perform live. Joe Biondi was captivated by music at a very young age. When Joe was around eight or nine years old he saw his uncle rocking out on a drum kit and was instantly mesmerized by the form of his playing style. In high school, Joe was in the concert band, the percussion ensemble and the marching band which made him proficient at sight reading music and rhythms as well as working efficiently in a group. Joe then began writing his own songs and started learning how to record them properly on programs like Ableton Live, Garageband and Logic. Later on, Joe formed many bands. A few months later, Joe was introduced to School of Rock. At 17 years old, Joe started working for the team by handing out promotional flyers in a park and eventually worked his way up to becoming a teacher at Red Bank and Matawan, running their very first summer camps. During this time, Joe found a new passion for teaching music as well as performing it. Joe graduated from Montclair State University where he studied Sociology and Music. Throughout college he worked at School of Rock Chatham as their receptionist and learned the behind the scenes of the day to day operations. Joe also worked at School of Rock Montclair as a drum instructor/Rock 101 director and worked there for two years. In 2012 Joe's family opened up their own School of Rock in East Brunswick. It is important for Joe to share his love and knowledge of music to the next generation of musicians while continuing to be inspired every day by all of the students that he sees on a daily basis. 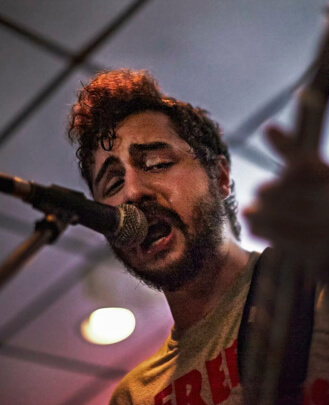 Ryan Permaul is a vocalist and bassist, based in in the NJ/NYC area, specializing in jazz, rock and reggae. From his early roots in classical cello, Permaul has always been on a quest to discover his musical voice through various genres. Initially falling in love with both reggae and The Beatles, (the latter being the focus of his first rock cover band), he saw great success as a musician in high school, winning leadership awards and joining the prestigious NJ Regional Choir and music honor society. He has followed this path to the Mason Gross School of the Arts, where he studies jazz bass with famed bassist Kenny Davis, formerly of "The Tonight Show," The Temptations, Earth Wind & Fire, and more. 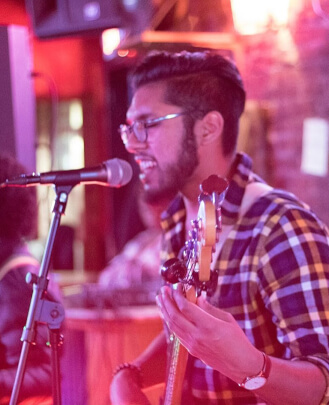 He has also seen great success in the regional tri-state area with his band, Tropic Vibez, where he takes the role of frontman, as well as vocalist and bassist. The band combines his love of rock music with reggae and jazz rhythms. Their first project, entitled "Sticky Pineapple," was released on all major platforms in early 2017, and Permaul is leading the band in the creation of their debut record to be released in 2018, while opening for national acts such as Ballyhoo! and The Supervillians at famed venues such as The Stanhope House.